With low-pressure crack injection, you can permanently repair a basement leak and foundation crack without high cost and disruptive excavation. These cracks typically due to drying shrinkage, thermal movement or other causes usually are minor and result in few problems. More often than not, a foundation crack will widen over time and result in water seepage or possibly the loss of structural integrity. Foundation and slab cracks are not only an eyesore, but they may hinder the value of the home. Crack Injection Process Get an overview of the basic steps involved in the crack injection process. DIY Crack Repair Learn about low-pressure crack injection kits for contractors and homeowners. How Crack Injection Works Discover what makes crack injection a cost-effective and permanent fix. Dual-Cartridge Dispensing Find out what the advantages of dual-cartridge dispensing are. Limitations of Low-Pressure Injection Find out when it may be necessary to pursue measures such as crack sealing. Carbon Fiber Staple for Crack Repair Cross-stitching concrete cracks with staples improves the long-term performance of the repair. Fortunately, there is an easy way to permanently repair such cracks without the need for costly and disruptive excavation or drain tile. 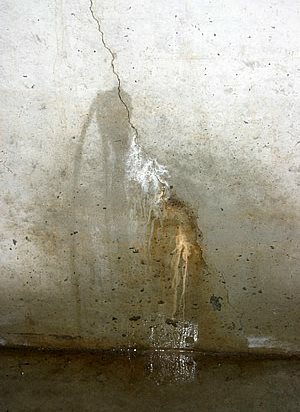 Poured foundation cracks may be repaired by using low-pressure injection of an epoxy or polyurethane foam material. For the repair of concrete floor cracks, certain epoxies and polyurea materials exists, suitable for such slab repairs. The application of such materials may be completed by a basement waterproofing contractor or a do-it-yourself homeowner. Either way, the repair of concrete cracks in either the foundation or the slab may efficiently and effectively be completed in as little as an hour or more.